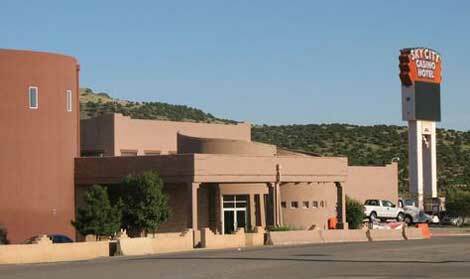 The Sky City Casino Hotel is located near Grants, NM and forty-five minutes west of Albuquerque, New Mexico on I-40. Bingo - see our Sky City Bingo page for more information. 40,000 square-foot Sky City CulturalCenter and Haak'u Museum on the floor of the Acoma Valley, at the foot of the mesa. Built atop a sheer-walled, 370-foot sandstone bluff in a valley studded with sacred, towering monoliths, Sky City has remained suspended in time for two millennia. The oldest continuously inhabited community in North America.